Once you hear the roar of packs of big bikes rumbling around the hills and highways of Phuket Island, you’ll know that Phuket Bike Week is coming. This annual event is always set in the month of April and is usually organized to coincide with Songkran, Thailand’s biggest festival. It has a number of concurrent fun events to entertain bikers, their friends, families, and onlookers including motorbike and custom bike exhibitions, Miss Phuket Bike Week competition, a beach party, concerts and a ride for peace, just to name a few. Lately, the bike week has been promoting the theme ‘ASEAN Ride Together’ to show the spirit of unity among Asian riders as many participants come from Malaysia, Singapore and neighbouring countries. The event’s main attractions take place on Patong Beach at Loma Park as well as at various locations in Patong, such as the football field across the road from the park and Jungceylon Mega Mall. The top activity that most motorcycle enthusiasts look forward to every year is the motorcycle exhibition. It’s a chance to have a closer look at some fancy shiny big bikes and choppers of various brands including Harley Davidson, BMW, Kawasaki and Yamaha. The custom bike show is also another highlight of the week-long event. It never fails to draw a big crowd year after year. Every early evening onwards during the week there are always some parties going on at the main stage in Loma Park. Within the same area, there are plenty of things to do and see such as checking out new tattoos and enjoying local street food. A must-do is to shop for some cool souvenirs including motorcycle gear such as helmets, leather products (including boots, jackets and gloves), T-shirts, caps, pins, stickers, bandanas and key chains. 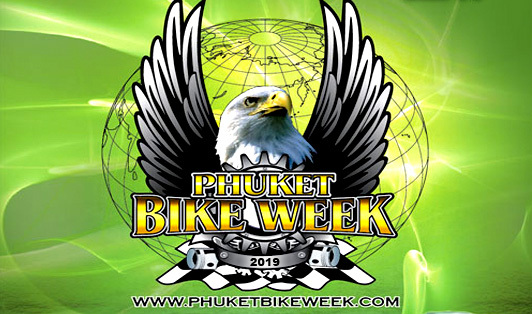 Big bikes and the island have a long history dating back almost two decades and Phuket’s Bike Week has become one of the leading big-bike gatherings in Asia. Phuket alone has more than 30 riding clubs that make up almost 500 bikers all together but there can be as many as 20,000 - 30,000 people joining this event each year. The venue is very much a family-friendly kind of event and enjoys a fun and fantastic atmosphere all around. Though some of the bikers might look tough, they hardly say ‘no’ to anyone who wants to take pictures of their two-wheeled babies. So don’t be shy – just ask!